Zombie comedy Shaun of the Dead was sadly never turned into a video game. However, artist Aled Lewis has created a screenshot that shows us how glorious such a game would have been. 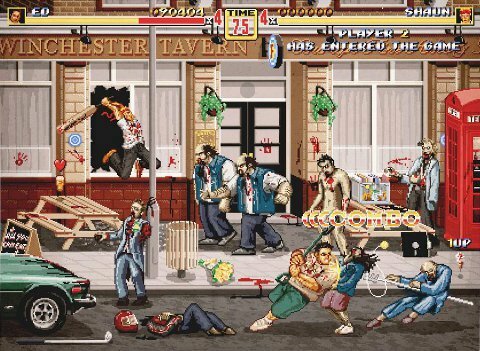 Lewis imagines a Shaun of the Dead game being a Streets of Rage-type brawler. Shaun and Ed pummel hordes of zombies outside of the Winchester Tavern. Shaun's cranky roommate Pete makes a cameo as well. This mock screenshot was created for the event "Crazy 4 Cult". This New York-based exhibit displays art based on cult movies. It will run from August 9th to September 1st. You can find out more information here. Had Shaun of the Dead been released today, the chances of a game adaptation would've been a lot higher. Shaun was released back in 2004, before Xbox Live Arcade, PSN, or iPhones existed. Small, downloadable games such as retro beat 'em ups are now all the rage on those platforms. The fact that the gaming industry is now more likely to apt to produce something like a Shaun of the Dead beat 'em up than it was 8 years ago tells me that the industry has made solid progress.